Camp David is an immaculate, peaceful and spacious 4 bedroom + office/bedroom, 3 bathroom Family Vacation Retreat that is located in Bolton Landing, NY. Camp David is close enough to the town of Bolton Landing while away from it all with it wooded surroundings and a small pond in front. It´s a vacation home where children can play on the playground while the family can relax near the fire pit. 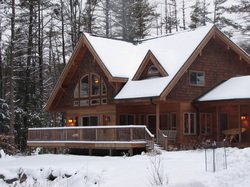 Camp David is located 2 miles north from Town of Bolton Landing, near Lake George, NY in the Adirondack Park. 2.5 miles from Sagamore Hotel. 5 miles from Adirondac Extreme adventure zip-line course. 18 miles from Six Flags Great Escape and Splaswater Kingdom. 28.5 miles from Gore Mountain Ski Resort. Camp David has an open floor plan, is fully furnished, has dishes, utensils and serve-ware to host Thanksgiving get-together, has a wraparound deck, fireplace, playhouse and an over sized sandbox. Maximum number of people staying overnight is 12 and dogs are welcome!